While talking about competitive gaming, there are some gaming equipment and brands which are highly known among professionals. The Zowie FK1 and FK2 are two gaming mice which have been ruling the budget segment for a couple of years now. Though it is evident that you are here to know about which mouse to choose, we have dug down some great details which we will further expose while doing a comparison between the Zowie FK1 vs. FK2. The FK1 is also available in a different size which is known as FK1+. Overall, while choosing the best among the three i.e the FK1, FK1+ and FK2, there is a slight doubt related to the features of these mice and which one would be the best pick. 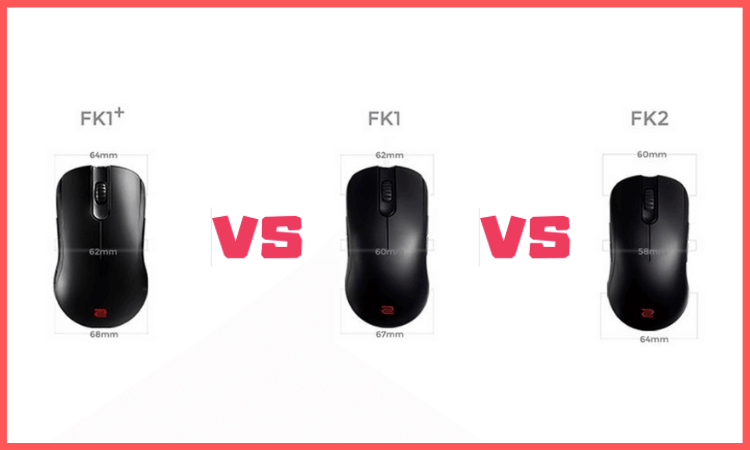 We have done the comparison between the Zowie FK1 vs. FK1+ vs. FK2 and brought you some amazing details which would help you to choose your next gaming mouse. Giving you a little idea about the brand, Zowie is a line of gaming equipment manufactured by the Taiwanese tech giant BenQ. These mice are primarily used by the eSports enthusiasts for competitive gaming because they have got a structure that supports a fast movement, less lags and even have the size preference according to the size of your palm. 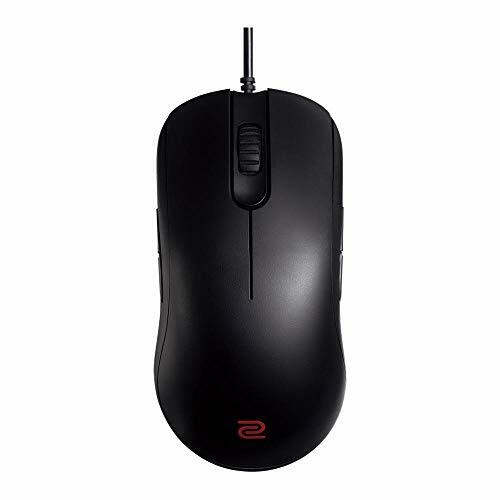 In a multiplayer gaming environment, it is very important that you use only a professional gaming mouse which offers you unmatched performance and grips well in hand. Time to check more details of the Zowie FK1, FK1+ and FK2. The BenQ Zowie FK mice have three main models: The Zowie FK1, FK1+ and FK2. All the models are built to support different palm size which helps you to maintain a tight grip on them while gaming. The design supports the claw and palm grip for a great gaming experience. Referring to the technical specifications, you should understand there is not much difference between the three of them apart from the size and weight. Let’s now review the mouse one by one. The Zowie FK1 is the bestseller among all the three gaming mice. The FK1 is perfect for claw grip users since it is smaller than the FK1+ and also weighs less. If you predominantly play FPS games then the FK1 will be the perfect pick. However, if you have a large palm, and by large we mean “very large” then you should consider buying the FK1+. It’s lightweight, ergonomic and tracks incredibly well. Perfect for small average sized hands. Best pick for claw grip users. Supports clever and effective sensitivity adjustment. No third-party software required to change the DPI setting. The Zowie FK1+ is almost similar to the FK1. This mouse comes in a very large size and hence, the plus sign in the name. Due to its large size, the weight is also considerably more than the FK1 and the FK2. This should be the perfect pick for people with large palm and the people who tend to rest their whole arm on the mouse while playing games or especially while shooting in FPS games. The comfortability is not compromised but still, it is not as nimble as the other mice. Has a relaxing and more spacious mouse face. This mouse works perfectly for all grips. Easy to change DPI by using the lone button underneath the mouse. 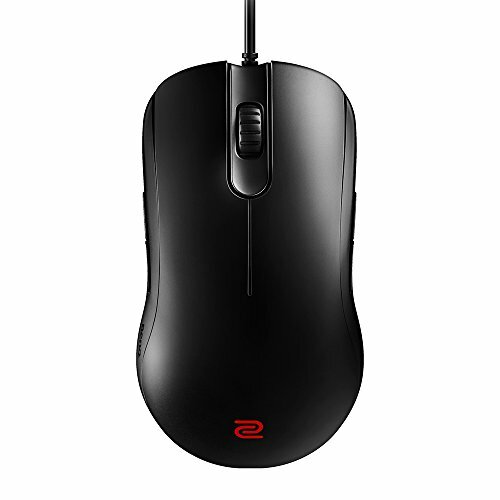 The Zowie FK2 is the smallest among the three variants. Due to the small size, it is also very light. The FK2 is noticeably small and is suitable for small hands. If you maintain a claw grip then this is the mouse you must consider buying. Some people do not lay their whole palm on the mouse and just hold the mouse with their fingers or claw. This improves agility. So the FK2 is specifically designed for such usage. The small size ensures that quick action can be taken with this mouse. The lightweight makes it quite nimble. This is an ideal pick for fingertip grip users. Back and forward buttons for better online browsing. Minimalist design with no fancy lights and buttons. Though, it is pretty clear that all the three models have the same features and just come in different sizes. DPI Control: You don’t need software like Razer Synapse or Logitech gaming software for changing the DPI setting. The mouse comes with DPI presets which could be changed easily with a press of a button. 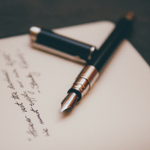 Ambidextrous Design: The ambidextrous design supports both right and left-handed people. Sensor: All three models have the same 3310 sensors. Cable Length: You will get a 2m cable. A normal user won’t fall for multiple features when it comes to choosing a mouse. However, if you ask a gaming enthusiast or a professional gamer who competes with others in events and forums, there will be many features and specifications to consider. 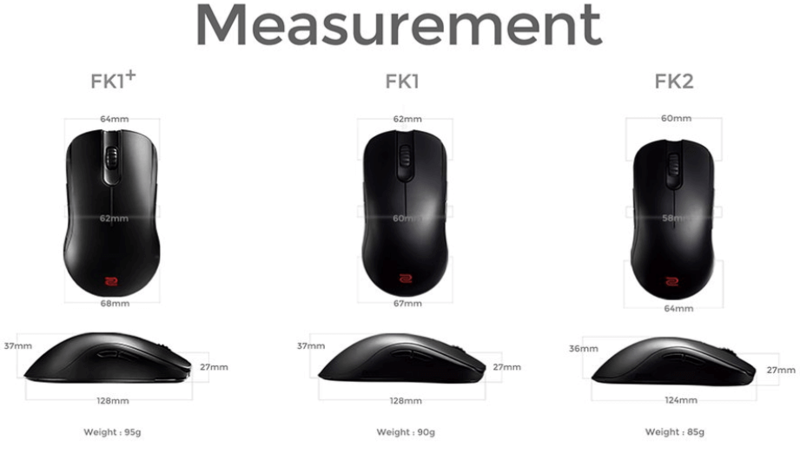 In the above comparison between the Zowie FK1, FK1+ and FK2, the race is among deciding that perfect size and weight of the mouse that would enhance your performance in the game. The mouse should fit perfectly in your hand and depending on whether you are palm, claw or a fingertip player, the mouse should meet the same. Weight also plays a major role as being a gamer, you prefer to move a mouse of a certain weight that suits your gaming performance. 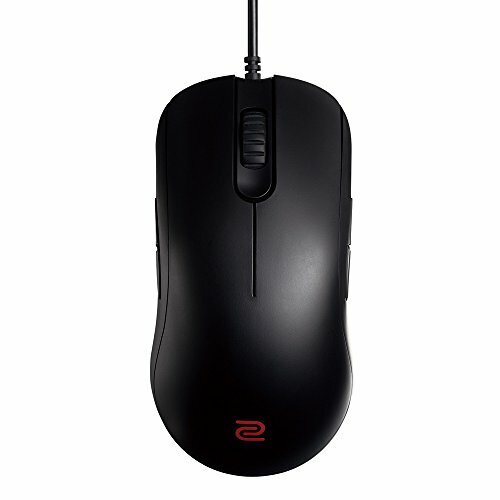 The Zowie FK range uses the Avago ADNS-3310 sensor which performs relatively well keeping the built of the mouse. The best part is that you need not to use any third party software for changing the DPI. All you need to do is press a button underneath the mouse to choose any preset DPI value i.e 400, 800, 1600, 3600. The LED light beside the mouse will indicate the DPI level you are using. Coming to the most important part, buttons in a gaming mouse need to have a nice tactile click. In the FK series, you will get the left and right click button including a scroll and two buttons on either side of the mouse. As per the reviews, the buttons offer smooth clicks with average travel time. You can activate either side buttons depending on whether you are left or right-handed. Regarding the scroll, to be frank, it is very average and not something from the top of the line. Though overall, the performance is good and wouldn’t face any miss or accidental clicks. As mentioned earlier, there isn’t any specific software for changing the DPI and other settings of the mouse. Typically everything ranging from the DPI range, polling rate, lift off distance and side button usage could be controlled by preset settings. You can use the combinations described below to change between right and left side buttons. Press and hold button 2 + 3: This activates the left-side buttons making it suitable for right-hand use. Press and hold button 1 + 3: This activates the right-side buttons. It is suitable for left-hand use. Time to test the FK1 and FK2 with the other big names in the segment. The comparison will be totally unbiased. 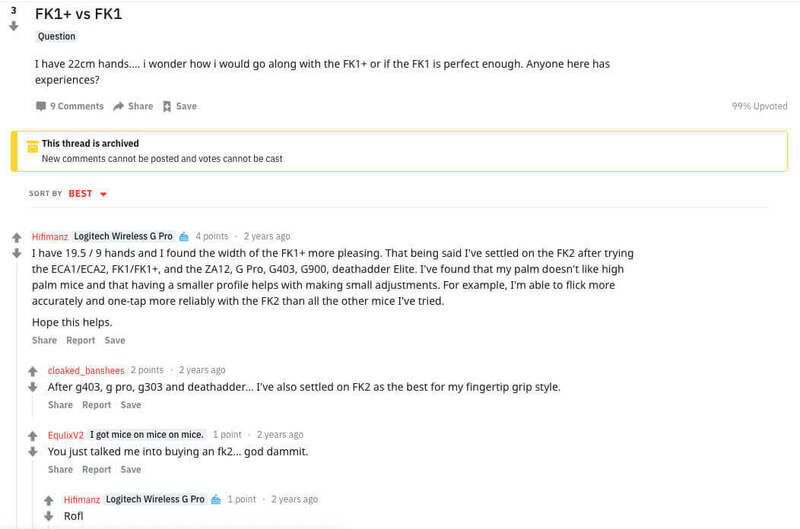 First of all, the Razer DeathAdder serves primarily the right-hand ergo market while on the other hand, FK1 and FK2 are ambidextrous mice which could be used by both right and left-handed people. The second big difference would be between the DPI range. The DeathAdder supports a DPI range of 10000 while in the FK1 and FK2, they support only 3200 DPI sensor. Apart from the features, the DeathAdder has a more pleasing design for sure. It includes the logo with Chroma lighting which supports 16.8 million customizable colour options. Comparing the Zowie FK series with the Logitech G403 or G703, the race would again be between the DPI ranges. While the Logitech supports a DPI range of up to 12000, the FK series has only 3200 DPI sensor. The wireless G403 in comparison to the FK2 looks quite similar but has a little tall design. In this case, we would suggest you go for the Logitech G403 or G703 if you have that kind of budget. Though there isn’t much to say because there isn’t any difference in the features of the mentioned mice. We have already suggested which mouse would be suitable for whom. From the average consumer date, we have found that the Zowie FK1 remains a bestseller among all three variants. It is small and is perfect for esports. Since all the three variants i.e the Zowie FK1, FK2 and FK1+ share the same features apart from having different size and weight, we suggest you choose the FK1 as it is highly praised by majority of the gamers who participate in eSports events. Finally, which mouse are you planning to buy? do share your inputs in the comments section below.